Shrink wrap sheeting is used in shipyards as a covering for ships and super yachts that are undergoing repair, refit and repainting. 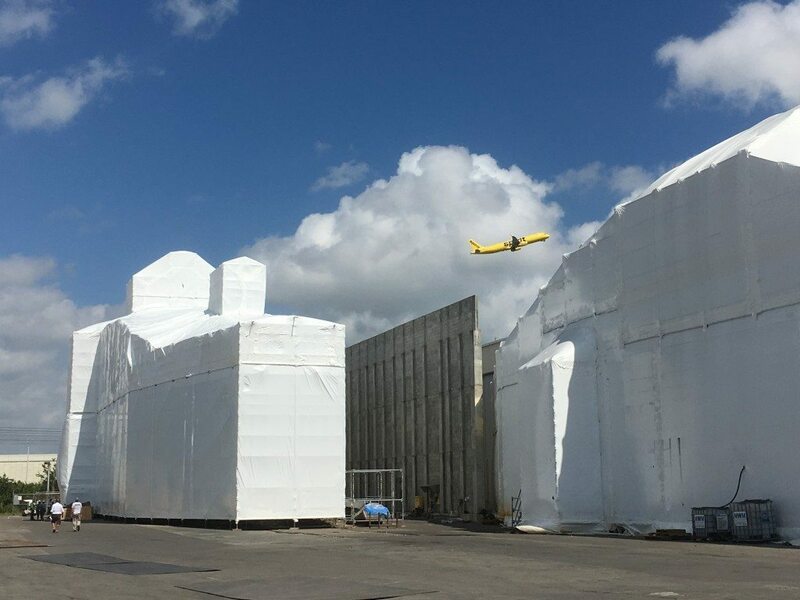 A shrink wrap tent allows work to take place in a controlled environment whilst containing dust and overspray from covering vessels located nearby. Paint Shed or Shrink Wrap Painting Tent? In an ideal world, the repainting and refinishing of all ships and superyachts would take place inside a dedicated paint shed. A dedicated building allows for optimum environmental and working conditions. However, it is often not be possible to find a paint shed that is available, or the vessel may may be too large. Even where a dedicated painting facility is available, costs can be high. Over the last decade, scaffolding tents have evolved to overcome some of these limitations with finding dedicated buildings. 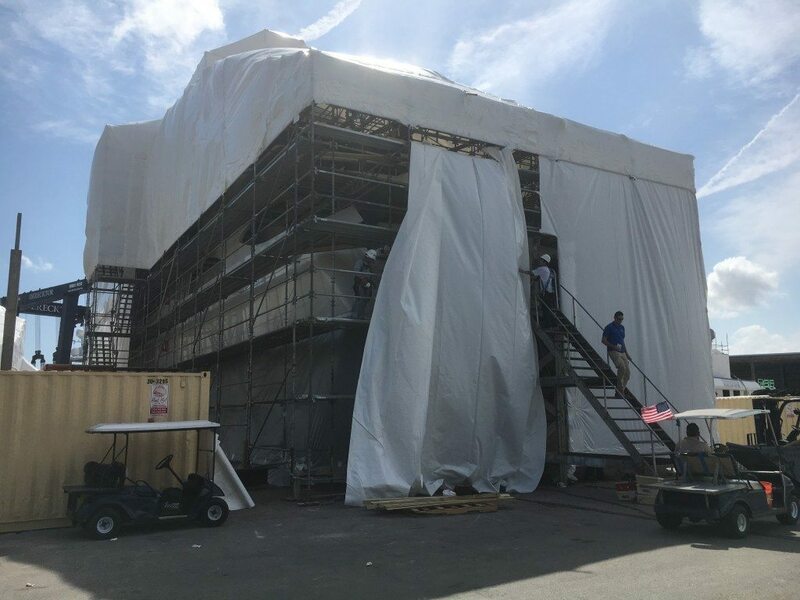 Once the scaffolding structure has been erected, industrial grade shrink wrap sheeting is used to create a continuously bonded skin around the yacht. The tents are fitted with heaters / air conditioning and powerful extraction systems in order to create the controlled environment required for painting. What are the benefits of shrink wrap yacht tent? Ashore or Afloat – A key benefit of using a shrink wrap tent for yacht painting is that it is possible for the yacht to remain in the water which can save on lifting and slipway / hard standing costs. Robust – A yacht tent may be exposed to high winds. 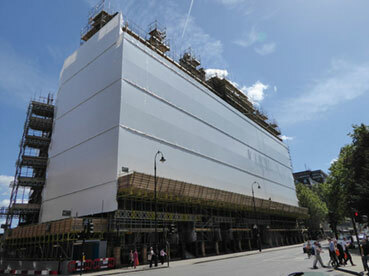 However, because scaffold shrink wrap is shrunk ‘drum tight’ it will not flap or detatch in high winds. 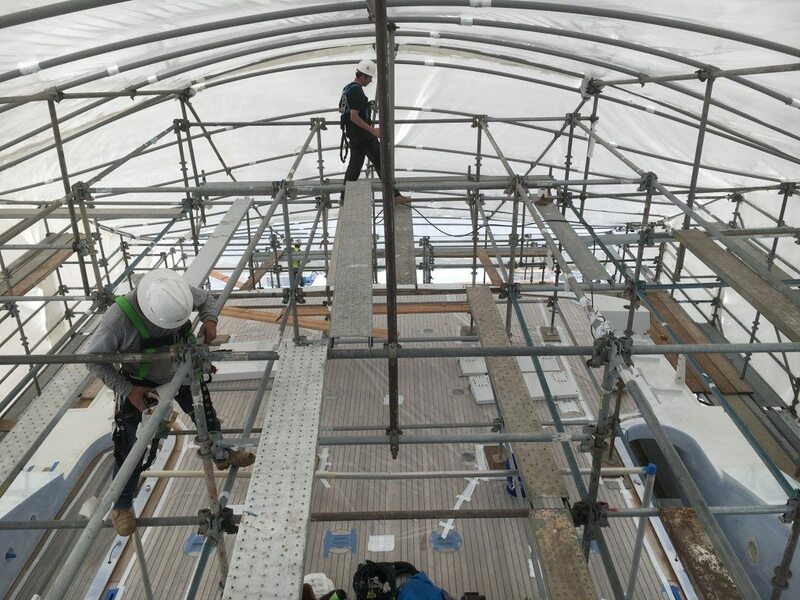 Effective containment - Welded joints between individual sheets of shrink wrap scaffold sheeting create highly effective environmental containment and temperature control within the tent. Versatility - Because it is a shrink to fit solution, which is cut and welded ‘in situ’ there is no restriction on the size and shape of the scaffolding structure. The shrink wrap tent may be designed to follow the shape of the yacht. Superyacht Painting Tents – Which Shrink Wrap Is Best? Thickness – Whilst a 190 micron (7 mil) thick film may be good enough for shrink wrapping small boats for transport and storage, for scaffold shrink wrapping you should consider using a shrink wrap film of at least 300 micron (12 mil) thickness. Why? These construction grade films will be stronger and have better resistance to ultra violet light. Shrink Ratio - It seems fairly obvious that shrink wrap sheeting should shrink but there can be huge variations in performance between brands. Ask your supplier for a specification sheet and check the shrink ratio. You need a shrink wrap film that has balanced shrinkage. It will not be precisely the same but a shrink ration of around 60/40 is optimum. This will ensure that the sheeting shrinks very tightly around the scaffolding structure. Erecting a scaffolding structure around a super yacht is a skilled profession. These are some of the key points to consider when looking for a superyacht scaffold tent. Safety should always come first when erecting and using scaffolding. Whilst basic structures may not require special permits, those that are longer, taller may require that engineering drawings be produced. As a minimum, the scaffolder should complete a detailed risk assessment and method statement prior to work commencing. Any scaffolding company should have proper training. Those that are registered with scaffolding bodies in the UK must have this training. Always ensure that you are dealing with a company or individual that has been trained in the proper use of scaffolding. It is a legal requirement in most countries that any company with employees has employers’ liability insurance. As the person responsible for employing the scaffolding, it is your responsibility to ensure that the company in question has appropriate insurance, Public liability insurance is also a legal requirement, and this ensures that if any damage is done to property or people are injured as a result of the scaffolding company’s work, they are insured to cover the damage. Whilst standard scaffolding construction may be within a companies capability, the completion of marine scaffolding around a ship or superyacht may be considerably more difficult. In these cases, experience counts, and it will be required. Ask for examples of similar jobs undertaken. At Rhino we have worked with many scaffolding companies world-wide who specialise in shipyard work. If you require any assistance call our friendly team today. How much does scaffold shrink wrapping cost? The cost of shrink wrap sheeting will depend on the flame retardant grade (EN1501 or LPS1215) and the quantity supplied (less than or more than a full pallet quantity). We advise that, as a guide, sheeting ‘supply only’ costs from £1.35/m2 and ‘fully fitted’ costs from £6/m2. How do I dispose of scaffold wrap? Shrink wrap is manufactured from 100% virgin LDPE resins and nearly every waste company will welcome it for recycling and should be able to provide you with documentation as evidence that you have disposed of it in a responsible way. As always, contact us if you need assistance. How much does the shrink wrap shrink? When we measure the shrinkage of shrink film we look at the shrink in the ‘machine direction’ and the ‘transverse direction’. What we are looking for is a film that shrinks equally in both directions, sometimes this is referred to as ‘bi-axial’ shrinkage. A good quality scaffold shrink wrap film will have a shrinkage in each direction of 40-60%. For more information on buying shrink wrap films take a look at our buyers guide. Where a scaffold sheeting project needs to achieve full containment then it is typical for ‘final seal’ to be required. Final seal refers to the process of creating a sealed joint between the scaffold sheeting and a floor / wall / ceiling. The process for creating a final seal may vary depending on the project but generally the process is to install a scaffold tube as close the floor / wall / ceiling where the final seal is required. This tube will bear the weight of the shrink wrap film and any wind loadings. After the shrink wrap sheet has been joined and welded around the scaffold tube, then a shrink wrap ‘skirt’ is used to bridge the gap between the scaffold tube and the floor / wall / ceiling. The shrink wrap skirt is easily heat welded / taped to the shrink wrap in the normal way. The seal to the floor / wall / ceiling can be more challenging but is undertaken using wooden batten / adhesive tape / spray adhesives. What are the main disadvantages of scaffolding shrink wrap? The scaffolding structure must be built flush. Light winds are required during the fitting and heat shrinking process.